It was in year 1 that I learnt that there were different seasons. Growing up in Nairobi, for us it was always hot during the day, cold at night and the occasional showers in April and October. That was pretty much what the weather was back then. Words like Summer, Winter, Spring and Autumn were all new to me, seasons not experienced as yet. Postcards and pictures in books made them all seem like such refreshing and exotic seasons. When my aunt and cousins went off to UK in the 70s its then we would hear from them how windy the autumns were, umbrellas flying away and how their hands would get ice cold shovelling the snow. Mombasa’s hot weather was the hottest we would ever experience when we went there for our holidays in December. My first experience of a really scorching hot Indian Summer was when I was 12. That too in the really hot city of Ahmedabad and in May! It was unbearably hot for a girl who comes from a cool climate of Nairobi. My skin would burn and I’d get headaches. Back then, there were no reminders on television, radio or newspapers to stay hydrated. After a week or so I went to Mt. Abu and realised that summer everywhere in India is not as hot as Ahmedabad. My first experience of Autumn in UK was nearly 10 years ago. Chilly cold, windy, rainy and yes umbrellas would fly away. Just a few minutes outdoor and my nose would be all cold. However, I enjoyed the cold as I had had enough of the hot weather in Mombasa. Autumn in Canada which we witnessed in 2013 was an amazing experience, full of sun shine, colours and a bit of rain. So while all my family and friends living abroad, praise summer and wait for summer eagerly, I cannot seem to understand why! Its only after having spent the chilly autumn in UK that I realised what people meant when they say ‘our bones need the heat’. Literally one gets the feeling that bones get cold in autumn and winter. Summer in India or other parts of the world is synonymous with flipflops, summer hats, caps, bikinis, sundresses, shorts, T shirts, ice creams, golas, chatpatta snacks, open air markets, picnics, sand, beach, cocktails, fragrant flowers, longer days, lazing under the shade of trees, sleeping on the lazy chair, feeling lethargic, cricket, football, sandwiches, funfairs,walks in the park or beaches, late evening outings, coconut water and so much more. When my kids were young, I would make them simple popsicles..freezing fresh fruit juice, ribena or even rose milk during the really hot season. Nowadays, with kids having left the coop, it’s hubby and me only. Popsicles are a healthier way of satiating my hubby’s call for dessert ever single day. Sometimes, I just freeze fresh fruit juice or on some days when I feel a bit energetic, then I may add something exotic to the fruit juice. This week our #FoodieMonday#Bloghop group decided on #Frozencoolers as the 87th theme. Mangoes and pineapples have disappeared and the market is flooded with watermelons. A couple of days ago I went to Nakumatt and complained on my cousin whatsapp group that the veggies section only had watermelon, coconut and ginger all spread out on the shelves. My young cousin replied, “waiting to see what concoction you come up with using these ingredients”. Well here is my concoction, watermelon coconut and rose popsicles with a hint of ginger. Puree the watermelon without any water in a blender. Strain the juice to remove seeds. Put the juice back in the blender. Add shredded coconut, mint leaves, rose syrup and ginger. Pour the juice into popsicle molds. Freeze for 4-6 hours and serve. If you don’t like the taste of rose syrup add honey, maple syrup or simple sugar syrup instead. If you don’t have popsicle molds, use ice cream or small plastic cups. Pour the juice in the cups. Cover with foil. Make a slit in the foil, insert the stick in through it gently. Ginger helps to fight tiredness, bad summer microbes, loss of appetite and feeling of heaviness. I’ve made these popsicles adding desiccated coconut and they didn’t turn out too exciting. The bite of fresh coconut is what makes these popsicles yummy. Spike your popsicles with some vodka, gin, tequila, triple sec, champagne, gin for an adult version. 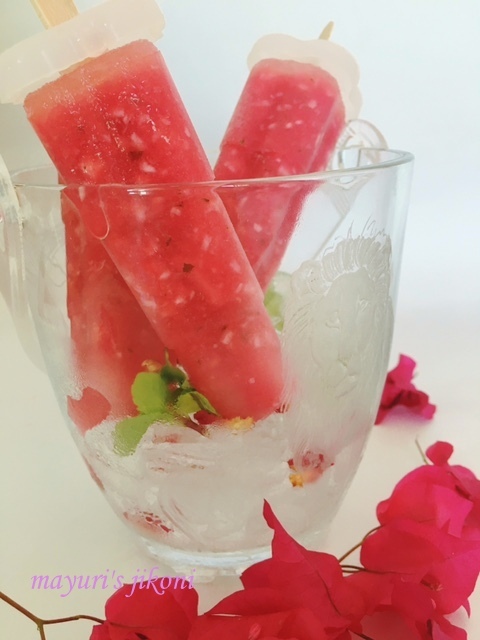 watermelon coconut and rose popsicles with a hint of ginger is an awesome combination to beat the heat. Sounds a refreshing combination and the hint of ginger, fresh mint leaves definitely makes it a different popsicle. Amazing combo!! Popsicles look so refreshing.Perfect treat for this summer. Thank you Alka. They did turn out really tasty. Thanks Pushpita, the flavour combinations were simply cooling. Thank you Rafeeda, try the recipe,the girls may love it as it doesn't have sugar, its like having those real frozen fruit. Yes Kriti, summer in different parts of the world is different for all. I love fresh coconut,and wanted to add something to bite into. I love the addition of the rose it must have given the popsicles a wonderful lift paired with the refreshing watermelon. Thank you Nayna, the rose syrup did add a lovely flavour to the popsicles. Oh wow.. the combination of so many flavours sounds interesting.I'll try it one of these days as we are still in summer. This combination of watermelon , coconut and rose seems to be interesting. kids must love these beautiful and healthy popsicles. Thank you Ritu. It is very flavorful.